We provide a wide range of auto locksmith services to resolve all your auto locksmith needs throughout Essex and the surrounding areas. From emergency key repairs to ECU programming we can do it all and all at a very reasonable price. We use all the latest technology to assist you at the roadside saving you the expense of having to go your dealership and wait for hours, days or sometimes weeks for a key replacement of fix. We pride ourselves on providing a quality and efficient service for all our customers. From our quick call out times to the high quality finish of our work, we aim to make you feel completely satisfied with the services we provide. All of our services are carried out by our team of highly skilled and experienced auto locksmiths in the repair of vehicle locks and keys. If you've got a problem with your lock or key, more often than not our experts have seen it and dealt with the problem before. Lost your car keys? searched everywhere and you cannot find your keys but you need to use your car? Going to the dealership for a replacement key will take time you do not have, possibly need your car towing to the dealership and then could be up to a week before they have time to provide a replacement key for you. We provide an emergency key replacement service. Our auto locksmith comes to you and can produce a duplicate key and programme it to your ECU or immobiliser for your vehicle. A quick friendly service saving you the stress and cost of going to the dealership. If you need a lost, broken or stolen key replacing we provide a 24/7 emergency service or you book a time convenient to get you back on the road. Constant wear and tear on your car keys over time can weaken them and a common occurrence can be the key breaking in the ignition or door locks. Some people will try to start the vehicle with a broken key still in the ignition but we would advise against this as it can make the extraction more difficult. Our car key extraction service can normally remove the broken key from the lock within 30 minutes and then produce a replacement duplicate key to get you going again. If the key has broken in a door lock we can normally extract the key without needing to replace the lock. Our locksmith will remove the key and assess the lock to be sure there is no damage. If a broken key in the ignition is close enough to the point where it can be extracted without damaging any other components of the ignition then our locksmith should be able to remove it without having to replace the ignition. If the key has broken in the ignition with a lot of force being applied or it is too far down our locksmith will assess the situation and advise the best steps to proceed. If you have locked yourself out of the car, lost your keys or broken your car key and need to get into your car we provide a non destructive vehicle entry service. Our locksmiths are equipped with the latest technology and trained in non destructive entry of cars. We provide a quick and cost effective service to get you back into your car. We advise against attempting to get into your car yourself as this can often cause more damage and be more expensive than calling out an auto locksmith. Once we have gained entry to your vehicle we can also provide replacement keys if required. If you have problems gaining key less entry to your vehicle or have an immobiliser problem preventing your vehicle from starting our diagnostic fault finding service can resolve the problem. Using the latest equipment we can diagnose issues with the computer in your vehicle to identify the fault and resolve it. The Engine Control Unit and the immobiliser management system can be accessed to identify problems such as faulty sensors and key coding issues. Our locksmiths have years of experience in diagnosing and resolving issues in a cost effective professional manner. If you have lost your spare key, have a damaged key or need extra spares we can duplicate your key to replace or provide extra. Sometimes you only receive one key when you purchase a new car. Our spare key service provides spare keys at a time convenient for you and at a great price. We would recommend getting a spare key cut to help prevent loosing your only key and needing an emergency locksmith. Our mobile service can come to you at a convenient time and clone your key so you have a spare or spares available for that moment when you cannot find your keys. 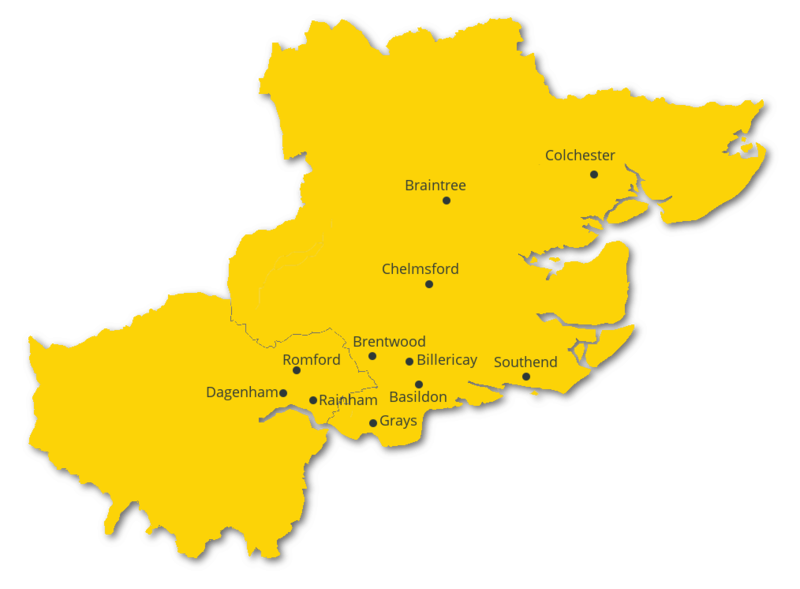 Basildon, Brentwood, Thurrock, Southend, Chelmsford, Dagenham, Romford, Rainham, Grays & Billericay. We would like to thank Dean for cutting us a spare key for our ford focus. We had previously had one cut from a shoe bar but would not work correctly. He came to our home re cut and programmed our key within an hour. We would definitely recommend to our friends and family, Thanks again. Called Essex Autolocks out as I had locked my keys in the van whilst at work myself. The locksmith turned up within 25 mins and opened the van. I am very pleased with service and will use again (hopefully not too soon tho!). Had Essex Autolocks out yesterday to cut and program a new remote on a Peugeot 207. I had phoned an auto locksmith that I normally use but he was unable to retrieve the pincode. Dean came within an hour or so and managed to get pincode. First time I have used Dean and will be using in the future. Thanks for a job done well. First class service! my wife had locked our keys in boot while out shopping. The locksmith arrived within 25 mins and managed to get into car without any damage. I would recommend using this company as not only was they efficient, the price quoted over the phone was the price paid ! thank you. A local family run business, we are leaders in vehicle key replacement and repair throughout Essex. With years of experience and prices far cheaper than your main dealer we are the only auto locksmiths in Essex you will need.